The museum or the "exhibitionary complex," as an architectural type, has throughout its history been a functional problem of creating a world of worlds. Michel Foucault argued that during the 19th century the museum was established as a "espace autres," a world outside of our own; a parallel preserved world, which we can view into for self-reflection, serving as a space of antagonism to propel our own condition into a utopia. The architect's charge is to plan individual rooms that each act as cellullar spaces for the viewing of art. Each room needs to function both as an individual autonomous world and simultaneously as a piece linked to a larger set of rooms in a wing, which is in turn nested within the museum as a whole. This fact, compounded with the acknowledgment that the museum is primarily a public institution that over the past century has continued to grow in size, encourages the conception of the museum as an interior city within the city. Historically, the rooms of the art gallery have been arranged in an "enfilade," a planometric tessellation of rooms usually orthogonal in nature, wherein their thresholds are designed to align along a linear axis. This room configuration, typically constructed at the domestic scale, has been the predominant spatial relationship exercised in museum design. Perhaps the most prototypical example would be the Dulwich Picture Gallery designed by Sir John Soane as England's first public art gallery. Opened in South London in 1817, the Dulwich gallery features five linear abutted rooms with thresholds in between, each lit from above with a respective sky portal. This design, reflects a tendency in earlier public art institutions to employ an architectural typology elongated along one axis to facilitate the movement through its enfilade plan in a linear direction. The Louvre in Paris, erected by Louis the XIII and later converted to an art museum, provides a larger scale example of this configuration. The original three-storey palace architecture features two and sometimes one-room wide enfilade wrapping its centralized courtyards. Before the turn of the twentieth century, the museum would diverge from this long access tendency in light of a room configuration spread in all directions, but still employing a domestic scale room to room axial alignment of the enfilade. Notable large-scale examples of this more mat-like plan would include, The Stedelijk Museum in Amsterdam designed by Adriaan Willem Weissman and the Metropolitan Museum of Art in New York designed by McKim Meed and White. This arrangement of rooms at the domestic scale provided the 19th century museum with the ample wall space required for the display of painting, the primary medium of art at the time. Central floor space between the adorned walls would house cases for small sculpture, fine crafts, and textiles. Curators became accustomed to utilizing rooms thematically, whereby each work within was linked by a time-period or concept and viewers would follow the walls with thresholds as breaks between each thematic world of art. The differentiated nature of contemporary art demands an "intermezzo", a sorbet in between luxuriant courses, in which to return to a state of equilibrium. This concept has been formalized in the exhibitionary complex as a neutral internal street or corridor. This is particularly useful given that exhibitions have switched from small objects into installation based media that encompasses the totality of the room inclusive of the walls, floor, ceiling and light conditions. Imagine moving from one dark room of a James Turrell light exhibition, succeeded by a net ensconced Ernesto Neto womb-like exhibit. The corridor provides a respite between these overwhelming sensory experiences allowing the viewer a return to the accustomed equilibrium of conventionality. The early stages of this intermezzo corridor can be noted in MoMA's Contemporary Art Annex in Queens, PS1, which opened its doors in 1997 in a former public school with a double-loaded typology. Here the class-rooms that flank the corridor on either side serve as the grounds for art intervention, where each room would be "let" to a different artist by the curator with the common hallway corridor providing access and pause in between exhibits. OMA's proposal for the National Museum of China in Beijing creates a reasonable simulacrum of the Baroque planning methods of the 17th century, summoning a likenesses to Charles L'Enfant's plan for Washington DC as one example. The plan is inscribed with five grand corridors, which push pedestrian traffic into the central plaza, dividing the plinth into five zones of varying scales of the traditional enfilade gallery. 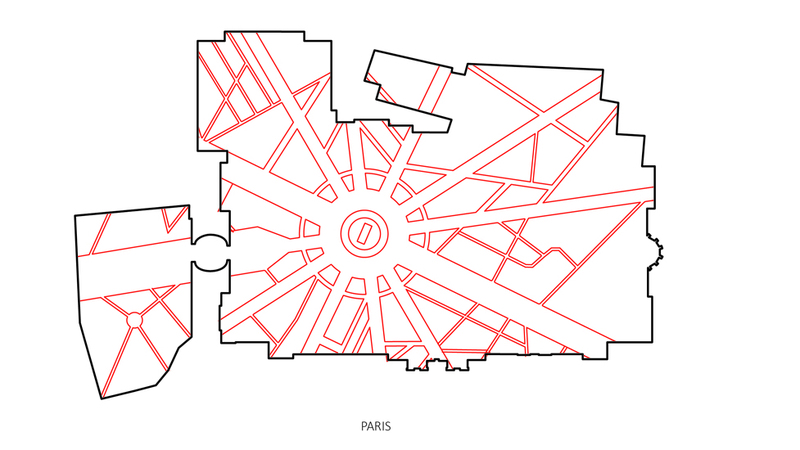 The invention here is the variation afforded in the enfilade and the use of the boulevards to serve as rapid access across the massive complex. Further, the plan is developed whereby this mechanism affords both peripatetic walking possibilities as well as the direct point to point movement across the totality, harkening the flaneur in the city. Similar to other Baroque plans the main boulevards converge at a center of verticality, herein the stairs, escalators and elevators embark the visitor to the upper storeys of the museum tower above. REX's proposal for the Munch Museum, features the plan of nine differentiated wings or large gallery neighborhoods. These unique conditions for art, each with their own variations of spatial parameters in shape, form, and light, are surrounded by an open periphery ring-road. This boulevard allows viewers the choice of entering the gallery system at any given point, while giving them the ability to motor past the galleries of which they are uninterested. Simultaneously, whilst circumambulating the museum, the viewer is provided panoramic views of the bay at the edge of the museum's world in the boulevard. Functionally, this also allows the museum to have its core service needs put into the center of the 9-square gallery grid, giving each exhibition type equal access to this loading and core infrastructural zone. Curatorally, this proposal allows the 9 neighborhoods to function as individual exhibitions or combine with their neighbor for larger joint exhibition developments. One notable example, would be the 21st Century Museum of Contemporary Art designed by the Japanese office of Sejima and Nishizawa, SANAA. The museum’s galleries, designed as a series of boxes of differing shape and size, are gathered within a large circularly extruded mass. 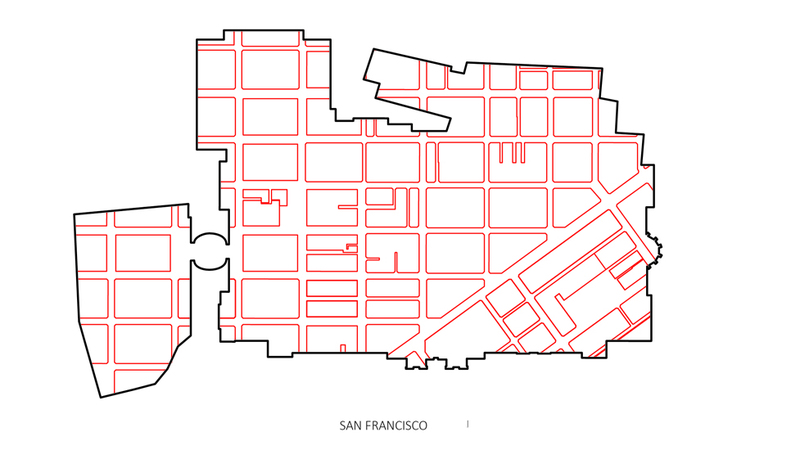 Each of these boxes are separated by a 3 meter corridor allowing for circulation around and between the individual galleries forming an urban grid. Each gallery varies along the spatial parameters of height, size, enclosure with both weather tight spaces and exterior courtyards, sky-lit spaces and dark spaces, and one cylindrical volume. These rooms offer variation in order to provide a differentiated set of conditions for the display of the diversity of contemporary art exhibitions. This grid provides the generic infrastructural field from which the respective galleries emerge as individual worlds pronounced with their own needs. 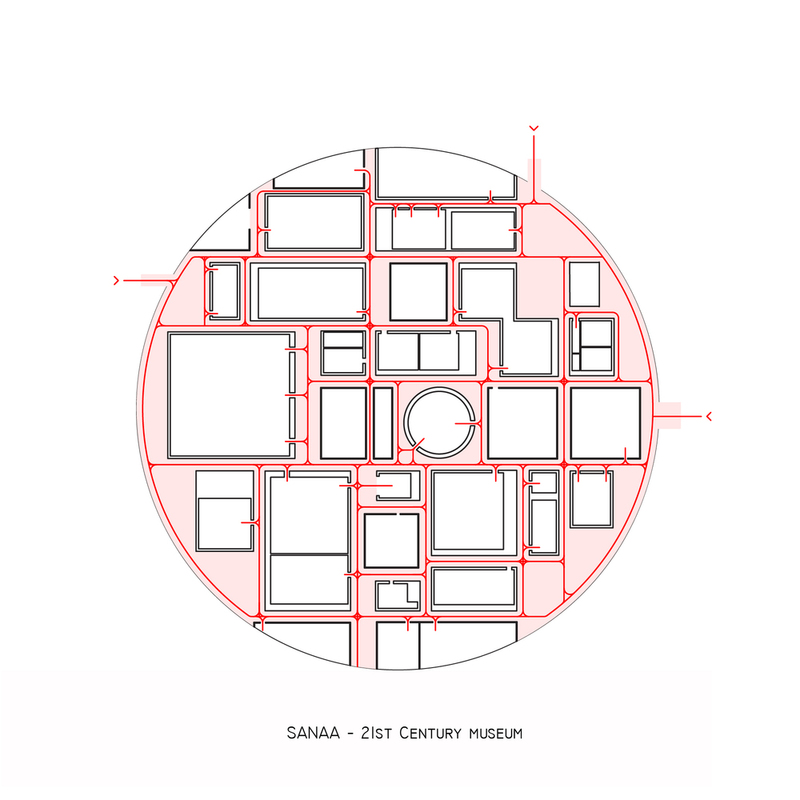 Additionally, the museums circular form allows the supplemental “ring-road” of circulation, creating a space for patrons to quickly circumambulate the museum’s floor plan along its glazed outer periphery. 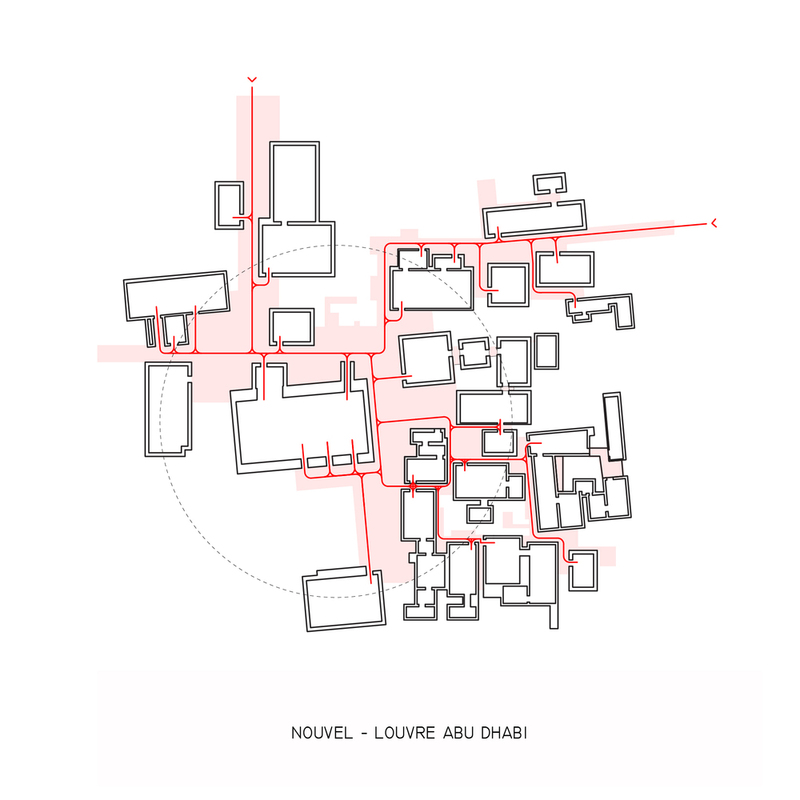 Jean Nouvel's Louvre in Abu Dhabi planned to be completed in 2015, along the shores of Saadiyat Island, similarly offers a method of urban interior formation. Herein a series of gallery boxes differentiated again by size and shape are gathered by a central circular form, in this case the shading structure of the roof. Underneath, the boxes exhibit a less ordered organization than that of the 21st century museum, lacking the formality of the orthogonal grid with a uniform offset. Rather, these gallery boxes are organized more in clusters, both in plan and in section, in order to create an urbanism more situated in the vernacular dwellings of the region. The clusters feature terraces and a more informal accretion of individual parts. The space in between the aggregations of boxes is in fact exterior space confined only by the shading structure above it, but otherwise open to the cross-breeze and elements. The juxtaposition between the interior worlds of the gallery rooms and the exterior in between world of the public is here exaggerated by having larger open zones of gathering spaces against the backdrop of the sea and landscape. The injection of the urban grid into the museum allows each of the individual rooms to function as their own autonomous world with pure circulation space for repose all underneath the curatorial umbrella of the larger exhibitionary complex. It is possible to imagine that the intermezzo corridor serves as an augmentation of the space of the threshold that existed between rooms in the historic enfilade. 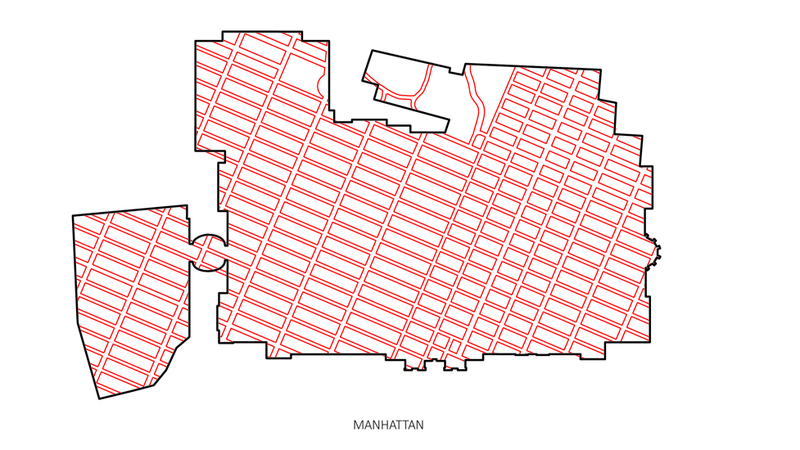 Further, it could be argued that the amount of circulation space, provided under this new paradigm, makes for a much less efficient building due to the redundancy of ways to move through the plan. However, this redundancy has some functional and institutional benefits beyond the experiential, including several curatorial merits that are afforded by the now detached free-standing galleries. One of the frequent disputes in museum design is the friction between the Architecture and the Curatorial control of the gallery. This paradigm offers each agent its own place in which to operate without restraint from the other, allowing curators and artists to work in the space of the gallery while leaving the circulation space to that of the architect. Furthermore most museums have temporary exhibitions that change-over three to four times in a given year. This paradigm's redundancy of circulation allows each exhibit room to be closed without affecting the larger circulation network, allowing these detached galleries to be re-constructed in phases as if urban lots redeveloped over the life of the city. Another argument for the recognition of the museum as an interior urbanism, which can be evidenced in these case studies as well a survey of the building of museums in the past two decades, is the type's conclusive growth in size into gargantuan public projects. Contemporary museum briefs call on architects to design projects that house space at areas equivalent to that of the great impermanent expositions in the middle of the last century. These expos such as the 1964 New York World's fair, though impermanent in nature, were designed and planned as micro-cities with towers where the public could witness their totality encompassing a multitude of acres. The contemporary museum not unlike the fair-ground and expo, are inconclusive of dining facilities, retail opportunities, event halls and educational facilities in addition to the increasing size of exhibition space. This acknowledgement of the growth of the museum, combined with the knowledge of the tendencies demonstrated via the Intermezzo, is suggestive of a possible movement towards a museum without walls. Once we can accept a wall-less museum we must inquire whether a city itself can act as the exhibitionary complex, where buildings within the urban conglomerate are curated together in one exhibition. Chicago based artist Theaster Gates has created the Rebuild Foundation, which seeks to "activate under-utilized public spaces in the community with arts and cultural programming." The foundation achieves this via the acquisition of derelict land in struggling parts of shrinking Cities for the use of the creation and display of art. The effect of this project is the creation of a singular art complex that exists throughout many small abandoned houses in a sub-urban setting, utilizing the actual streets as the connective tissue during art-walks. This strategy is suggestive of new possibilities for allowing the exhibitonary complex to grow to the scale of the urban and where the curator perhaps is integral within the public sector as an art or cultural planner. Other opportunities could emerge such as synergies of the cost of arterial infrastructure fostered by both the private and the public sector. Arguably, it is at this urban scale and proliferation of the objet d'art where the political contestation endemic to the mass reproduction of art is possible; it is here where the display and communicative power of art becomes insidious in between the planned an unplanned levels of the urban condition. To a small extent we can already witness the power of this effect informally during the Venice Biennale. Albeit it is difficult not to see Venice in its entirety as a "espace autres," due to its distinct vernacular, geographic removal, and current planned use as a predominant tourist location. Nevertheless, during the Bi-annual festival staged on the eastern island of Castello, several invited countries occupy historic buildings outside of the main festival's museum campus extending the zone of the museum to the other main islands of Santa Croce, Dorsodura and Cannaregio. The result of this encourages the art tourist to venture off of the main Venetian roads to find and explore the medieval grid of the city. This encouragement of exploration has an economic and political effect as it fosters business development around the arcane paths in the lesser traveled areas of the city. This suggests the city of Venice itself, during times of exhibition, becomes the interior of the museum and the museum interiority becomes the city. Perhaps this generally explains my own recurring claustrophobia after three days in Venice during the bi-annual festival. T.Bennett, The Birth of the Museum: History, Theory, Politics (London: Routledge, 1995) 59.